How do you present the complexity of busing in the 1970s to young children? With an even-handed, character-centered picture book, of course. 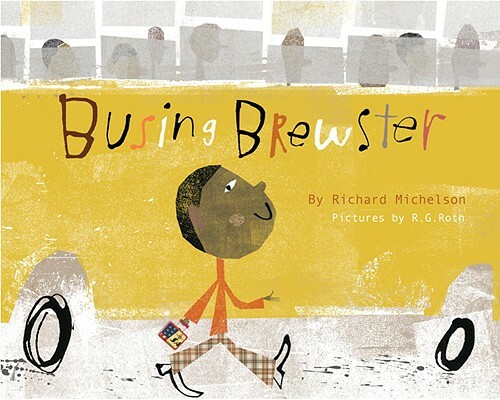 Richard Michelson's BUSING BREWSTER (Knopf) jumpstarts the conversation, introducing children to spunky first-grader Brewster, drawn with chin held high on the cover by R.G. Roth. At his new school, an Irish-American teacher named Miss O'Grady inspires Brewster by not laughing at his dream of becoming President. 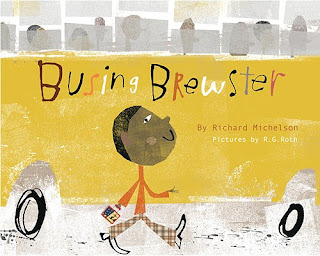 I couldn't help wondering, though, if Miss Evelyn, the first-grade teacher in his own neighborhood, couldn't have encouraged the same dream in Brewster. That's the question Michelson seems to be hinting at when he writes through Brewster's eyes: "Miss O'Grady's the librarian. She looks just like Miss Evelyn." A window into a time in history when children participated in one of the United States' most controversial social experiments, this picture book is also a mirror for a sweet relationship between a protective big brother and a happy-go-lucky little one. Richard Michelson was born in a mostly Jewish neighborhood in Brooklyn that became mostly black by the time he was 12. His family stayed, and his father was shot and killed in the family's hardware store by a black man. Michelson has dedicated much of his writing for children to reconciliation between the two communities, and informs each books with extensive research as well as his own lifelong relationships.